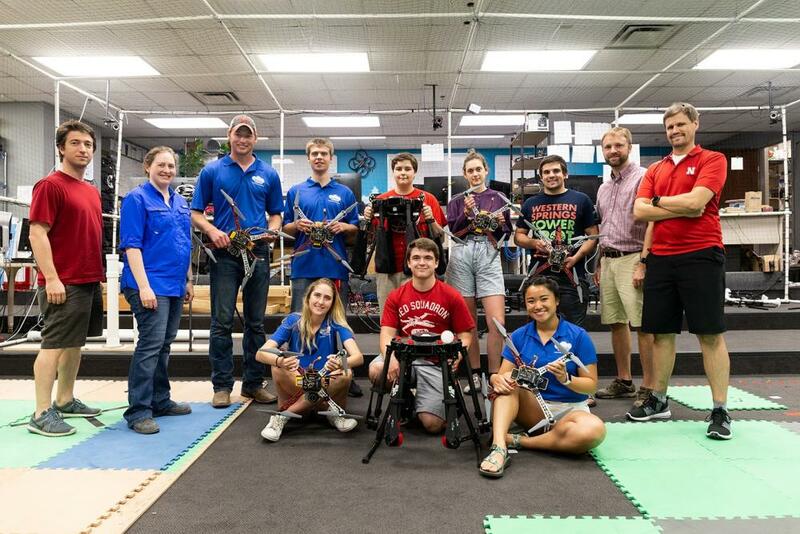 Members of the NIMBUS Lab posing in the Flying Cage where we test and evolve our systems. The REU site will provide undergraduates with a comprehensive research experience in the context of unmanned systems, a rapidly growing field of scientific and technological research. REU students will participate in carefully prepared research projects on unmanned systems with topics including attitude control of nanosatellites, behavior studies of robots in complex environments around humans, characterizing and developing vehicles for atmospheric profiling, and asset management during wildfires with unmanned aerial vehicles. Research activities across the projects will be structured to provide a systematic research experience for the cohort, while enabling flexibility for each participant to focus on a particular area. The projects will be hosted at the University of Nebraska-Lincoln's Nebraska Intelligent MoBile Unmanned Systems Lab (UNL NIMBUS), which has graduated over 30 undergraduate, master's, and doctoral students in the last five years, and is a leader in aerial unmanned systems and their application to the environment. One of the 2018 scholars works with Dr. Detweiler. Low Earth Orbit is a challenging environment in which increasing numbers of nanosatellites with commercial off the shelf components operate. Challenges such as communication, data collection, energy collection, and attitude control must come together with precise timing, usually utilizing inexpensive and imprecise COTS hardware, to accomplish mission objectives – a perfect Cyber-Physical System challenge. Current attitude control strategies, while robust, have fixed execution rates, consuming resources even during more quiescent portions of the orbital period. 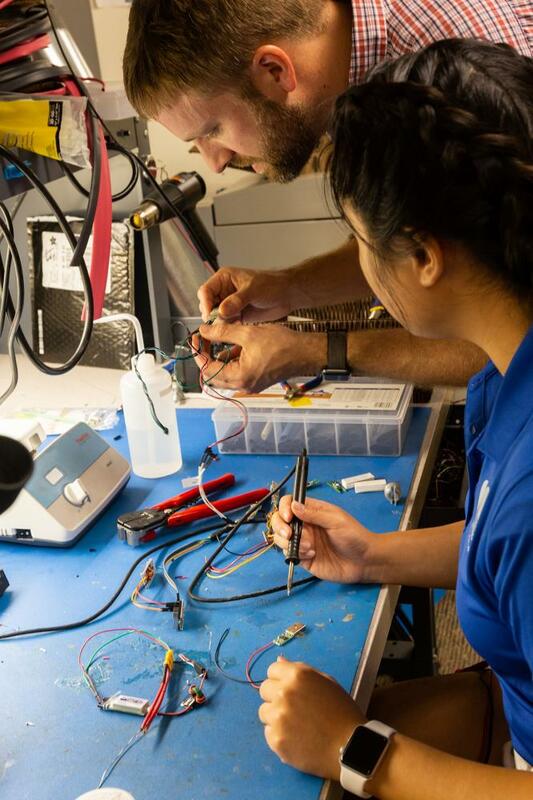 We are applying and extending state-of-the-art Variable Rate Sampling control strategies to attitude control for CubeSats that will more effectively allocate resources dynamically in response to environmental, physical, and cyber performance. These strategies have demonstrated that the CubeSat can accomplish more science objectives by carefully allocating resources holistically. The REU students on this project will work with learn how to operate our desktop CubeSat hardware emulator, understand sensors, actuators, and information feedback, adapt and analyze new control strategies in Matlab simulations, and then implement these designs in software and deploying their control strategy onto the CubeSat hardware emulator for the rapid prototyping and testing of new attitude control strategies in near-space-like conditions. Upon deployment students will use the hardware emulator to conduct tests for a variety of slewing and disturbance rejection maneuvers. The final report and poster will help students conduct a literature review on existing attitude control strategies for CubeSats as well as a description of their designed control strategy and finally reporting on both simulated and real test results. Understanding the lower thousand meters of the atmosphere is critical to better predict severe weather development and small UAVs have significant potential to aid in these measurements. Current weather monitoring relies on radars, weather balloons, and airplanes that primarily measure the atmosphere 1000 meters above ground level and ground based weather stations that measure the atmosphere between ground level and ten to fifty meters. The NIMBUS Lab is part of the NSF EPSCoR Track II 1539070 project Cloud-Map, which aims to develop UAVs that can be used as scientific instruments for atmospheric scientists. This project involves 17 faculty and more than 60 students in Nebraska, Oklahoma, and Kentucky. At UNL, one of our goals is to determine if off the shelf sensors (temperature, humidity, etc) can be used on UAVs and how to best to aspirate these sensors and insulate them from solar radiation. Preliminary results show that there are significant differences in sensor readings based on these configurations. The REU students involved in this work will work on an interdisciplinary team. They will learn about a variety of sensors, lead the characterization of these sensors in the lab, and assist in the field trials. Each REU student will also research a new type of atmospheric sensor that we have not yet investigated (e.g. liquid water content sensors, particulate size sensors, Doppler anemometers) and develop a configuration and mounting plan and the associated hypotheses as to how it will perform under different conditions. The REU students will participate in the CloudMap field trials with over 60 researchers to learn how to collaborate and present research to obtain feedback. Much of the current research related to unmanned systems approaches to humans in human-robot interactions occurs in simulated environments or with otherwise unnatural testing conditions that may make the results difficult to generalize. A significant portion of this research occurs in public spaces such as malls, but does not consider the impact of robot approach on the quality of the interaction. This line of research proposes to understand human attitudes toward unmanned system-initiated assistance in a public space in order to assist designers with decisions on how to build systems that are helpful and to aid public space administrators with decisions on how and when to deploy unmanned systems that will be beneficial to patrons. This project will assess the inclusion of a visible purpose (such as distribution of items) on interactions with various unmanned systems to determine whether it impacts acceptance and distancing. The REU students working with Dr. Duncan will be taught to run human subjects studies; by the first week’s end, they will be able to control vehicle approaches both manually and programmatically. By week four, the student will have added additional sensing capabilities to the unmanned system and have completed ethnographic observations designed to hypothesize about the research described above. The following three weeks will be devoted to running studies to address this hypothesis and resultant data analysis. In the final third of the summer, the student will be encouraged to develop (and present to the NIMBUS lab) a summary of their work and their own ideas about the next questions they would address within this research. In the context of this research, the student will participate in preparing a paper for publication in the IEEE International Conference on Human-Robot Interaction.